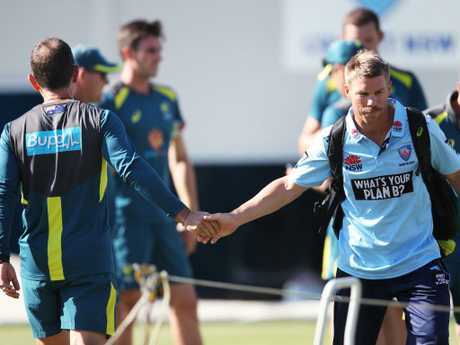 EXILED Aussie batsman David Warner is one month away from making his return to cricket - and there is reportedly still a gaping divide between him and some disgruntled teammates. Warner's decision not to chase a book deal shows he is committed to returning to the Aussie dressing room and trying to mend the broken relationships with some teammates. The report in The Age claims Warner is still not on speaking terms with some members of the Australian bowling group as a result of his actions during the fallout to the Cape Town crisis. Warner (12 months), former captain Steve Smith (12 months) and Cameron Bancroft (nine months) were all hit with heavy bans. It follows the damning reports in March last year that members of the Aussie fast bowling cartel were livid over a report that linked them with being involved in the ball tampering plot. A digital story at the time claimed the bowlers were also aware of Warner's plan. 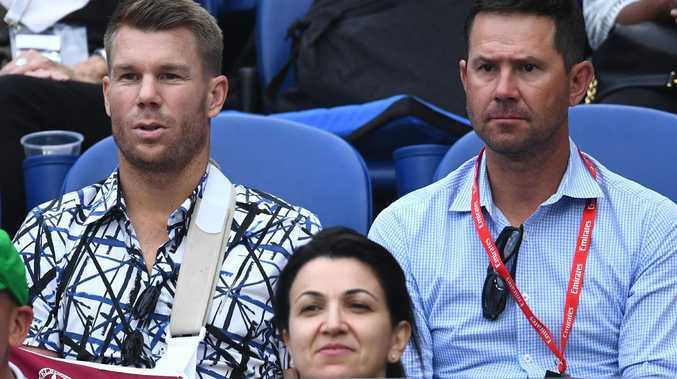 News Corp senior cricket writer Robert Craddock reported at the time reported that fast bowling group suspected Warner was the source behind the story. Craddock reported that Warner had gone "rogue" and left the team's WhatsApp group. Those wounds are still yet to be healed, The Age reported. The existence of a divide was further identified by Warner's manager, James Erskine, who said Warner was "cool" with Cricket Australia's preliminary plans to return him to the team. "My understanding is that there was a bit of tension, certainly not from David's side," Erskine said. "I think David has said: 'I am ready to play cricket, I am sorry for my part of it, and basically that's it.' He is not going to say anything. "I think Cricket Australia fully understand the relationship that they now have to have with their players has got to be, not the headmaster-student relationship, but it has got to be a symbiotic relationship where they are all work together because the next generation of cricketers will not put up with that. They want to have a happy band. The report said interim Cricket Australia high performance chief Belinda Clark was planning to stage a meeting between Smith, Warner and the rest of the dressing room - and considering using professional mediators to ensure the peace talks progressed smoothly. Meanwhile, Erskine says he has received offers from both TV networks and book publishers offering more than $100,000 for Warner to reveal what really happened in the Cape Town dressing room during the spiteful series. He said it was not in Warner's best interest to tell his story right now, just a month out from his potential return to the Aussie team. Warner's 12-month suspension ends in the middle of Australia's Twenty20 and ODI series against Pakistan in the UAE, beginning March 22. That series follows Australia's limited-overs tour of India. David Warner with Australian coach Justin Langer. Warner will be available for the second half of the Pakistan series if he is physically cleared to return from minor elbow surgery. Smith will not return during the Pakistan series as he has a longer forecast recovery schedule following his own elbow surgery. Smith and Warner are eligible for selection again on March 29, meaning they can be called up for the fourth ODI against Pakistan. The teams will then move to Abu Dhabi for the third match on March 27, with the final two games in Dubai on 29 and 31 March. The confirmation of dates for the Pakistan series also gives Australian players with lucrative Indian Premier League contracts a measure of clarity, as players called up for the series will not be immediately released for the IPL. The 2019 season of the IPL is scheduled to begin in late March, with Australian players selected for the Pakistan series expected to be unavailable until April 2 at the earliest.